Nylon, a linear polyamide ubiquitous today in textile applications, was first synthesized for mass production by DuPont in 1939 as a replacement for silk. In our proposed synthesis of the most common form, Nylon 6-6, a carboxylic acid is chlorinated before the addition of a diamine links the resulting chlorides together in a polymerized chain. Ten mmol (1.46 g) of adipic acid is placed in a 100-mL round-bottom flask equipped with a condenser, gas trap for HCL, and stir bar. Add 3.57 g (2.17 cc. 0.03 moles) of thionyl chloride (sulfurous dichloride) at once. The mixture is heated gently over heating mantle and stir plate held at 50–60° C. After about four hours, reaction is complete and evolution of hydrogen chloride has ceased. The flask is connected to a downward condenser tube and heated under diminished pressure by a heating mantle to remove any excess thionyl chloride. The light yellow residue of adipoyl dichloride is ready for use. Note: this reaction involves toxic vapors – use the ventilation hood at all times. Disposal: Wash the nylon thoroughly with water and place in a waste basket for disposal. The liquid wastes should be poured into special designated containers. Pour 10 mL of a 5% aqueous solution of hexamethylenediamine (hexane-1,6-diamine) into a 50-mL beaker. Add 10 drops of 20% sodium hydroxide solution. Carefully add 10 mL of a 5% solution of adipoyl chloride in cyclohexane to the solution by pouring it down the wall of the slightly tilted beaker. Two layers will form and a polymer film will immediately form at the liquid-liquid interface. Using a copper-wire hook (6 inches, bent at one end), gently free the walls of the beaker from polymer strings. Hook the mass at the center and slowly raise the wire so that polyamide forms continuously, producing a rope that can be drawn out for many feet. The strand can be broken by pulling it faster. Rinse the rope several times with water and lay it on a paper towel to dry. With the piece of wire, vigorously stir the remainder of the two-phase system to form additional polymer. Decant the liquid and wash the polymer thoroughly with water. Allow the polymer to dry. Do not discard in the sink; use a waste container. First Step Product: Adipoyl dichloride: reacts violently with water, while having a greater density; this unfortunately prevents a simple trip to the separatory funnel. 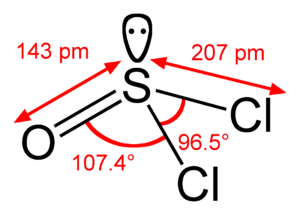 The boiling point is 105-107° C (at 100 kilopascals) compared to the reactant thionyl chloride’s 76° C. One could easily heat a beaker of the mixture to 80° C and remove the thionyl chloride while keeping adipoyl dichloride. Second Step Product: Nylon 6, 6: a stable polymer. The technique used to synthesize nylon (pulling substance that forms the barrier between two liquids) is sufficient for purity standards; other reagents are highly unlikely to work their way into the chain. Washing the nylon with water should be sufficient to remove excess unreacted reagents from the product, considering that many of the reactants utilized in the synthesis react with water while nylon itself does not. The product is a polyamide salt, heating and drying will remove excess water. Skin: May cause skin irritation. Adipic acid exerts a drying action on the skin and may cause dermatitis in humans. Ingestion: Ingestion of large amounts may cause gastrointestinal irritation. Inhalation: May cause respiratory tract irritation. Clinical examination of workers engaged in adipic acid manufacture found that inhaling adipic acid dust produced functional disorders of the autonomic nervous system and gastrointestinal tract and in the mucosa of the upper respiratory tract. Ingestion: If swallowed, do not induce vomiting unless directed to do so by medical personnel. Never give anything by mouth to an unconscious person. Get medical aid. Inhalation: Corrosive. Effects should be less severe than from exposure to higher concentrations of sulfuric acid. Symptoms may include irritation of the nose and throat, labored breathing, as well as lung edema, damage to the mucous membranes and upper respiratory tract. Ingestion: Corrosive. Effects should be less severe than from exposure to higher concentrations of sulfuric acid. Symptoms may include severe burns of the mouth, throat, and stomach. Circulatory collapse with clammy skin, weak and rapid pulse, shallow respirations, and scanty urine may follow ingestion or skin contact. Circulatory shock is often the immediate cause of death. May cause sore throat, vomiting, diarrhea. Skin Contact: Corrosive. Effects should be less severe than from exposure to higher concentrations of sulfuric acid. Symptoms may include redness, pain, and burns to the skin. Circulatory collapse with clammy skin, weak and rapid pulse, shallow respirations, and scanty urine may follow ingestion or skin contact. Circulatory shock is often the immediate cause of death. Eye Contact: Corrosive. Effects should be less severe than from exposure to higher concentrations of sulfuric acid. Symptoms may include blurred vision, redness, pain, and burns to eye tissue. Concentrated solutions can cause blindness. Chronic Exposure: Long term exposure to mist or vapors may cause damage to teeth. Chronic exposure to mists containing sulfuric acid is a cancer hazard. First aid procedures given apply to concentrated solutions. Exposures to dilute solutions may not require these extensive first aid procedures. Inhalation: Remove to fresh air. If not breathing, give artificial respiration. If breathing is difficult, give oxygen. Call a physician immediately. Ingestion: DO NOT INDUCE VOMITING. Give large quantities of water. Never give anything by mouth to an unconscious person. Call a physician immediately. Skin Contact: In case of contact, immediately flush skin with plenty of water for at least 15 minutes while removing contaminated clothing and shoes. Wash clothing before reuse. Excess acid on skin can be neutralized with a 2% solution of bicarbonate of soda. Call a physician immediately. Eye Contact: Immediately flush eyes with gentle but large stream of water for at least 15 minutes, lifting lower and upper eyelids occasionally. Call a physician immediately. Eye: Causes eye burns. Causes redness and pain. Lachrymator (substance which increases the flow of tears). May cause chemical conjunctivitis and corneal damage. Skin: Causes skin burns. May be absorbed through the skin in harmful amounts. Causes redness and pain. Ingestion: Harmful if swallowed. May cause severe and permanent damage to the digestive tract. Causes gastrointestinal tract burns. Inhalation: Causes chemical burns to the respiratory tract. Inhalation may be fatal as a result of spasm, inflammation, edema of the larynx and bronchi, chemical pneumonitis and pulmonary edema. Exposure through inhalation may result in delayed pulmonary edema which may be fatal. Death may result hours after initial exposure. Toxic exposure to fumes of Thionyl Chloride reacting with water may result in a delayed pulmonary response (longer than two weeks) of bronchiolitis Obliterans-inflammation of the bronchioles. Chronic: Chronic exposure may cause effects similar to those of acute exposure. Eyes: Get medical aid immediately. Do NOT allow victim to rub eyes or keep eyes closed. Extensive irrigation with water is required (at least 30 minutes). Skin: Get medical aid immediately. Immediately flush skin with plenty of water for at least 15 minutes while removing contaminated clothing and shoes. Wash clothing before reuse. Destroy contaminated shoes. Inhalation: Get medical aid immediately. Remove from exposure and move to fresh air immediately. If breathing is difficult, give oxygen. Do NOT use mouth-to-mouth resuscitation. If breathing has ceased apply artificial respiration using oxygen and a suitable mechanical device such as a bag and a mask. Eye: Contact with eyes may cause severe irritation, and possible eye burns. May cause conjunctivitis and corneal inflammation. Skin: May be absorbed through the skin in harmful amounts. May cause skin sensitization, an allergic reaction, which becomes evident upon re-exposure to this material. May cause severe irritation and possible burns. Ingestion: May cause liver damage. May cause severe gastrointestinal tract irritation with nausea, vomiting and possible burns. Exposure may cause anemia and other blood abnormalities. May be harmful if swallowed. Inhalation: May cause allergic respiratory reaction. May cause severe irritation of the respiratory tract with sore throat, coughing, shortness of breath and delayed lung edema. May cause effects similar to those described for ingestion. Chronic: Prolonged or repeated skin contact may cause dermatitis. May cause fetal effects. Skin: Get medical aid. Immediately flush skin with plenty of water for at least 15 minutes while removing contaminated clothing and shoes. Wash clothing before reuse. Destroy contaminated shoes. Ingestion: If victim is conscious and alert, give 2-4 cupfuls of milk or water. Never give anything by mouth to an unconscious person. Get medical aid immediately. Inhalation: Get medical aid immediately. Remove from exposure and move to fresh air immediately. If not breathing, give artificial respiration. If breathing is difficult, give oxygen. Do NOT use mouth-to-mouth resuscitation. Eye: Causes eye burns. May cause chemical conjunctivitis and corneal damage. Skin: Causes skin burns. May cause deep, penetrating ulcers of the skin. May cause skin rash (in milder cases), and cold and clammy skin with cyanosis or pale color. Ingestion: May cause severe and permanent damage to the digestive tract. Causes gastrointestinal tract burns. May cause perforation of the digestive tract. Causes severe pain, nausea, vomiting, diarrhea, and shock. May cause systemic effects. Inhalation: Irritation may lead to chemical pneumonitis and pulmonary edema. Causes severe irritation of upper respiratory tract with coughing, burns, breathing difficulty, and possible coma. Causes chemical burns to the respiratory tract. Aspiration may lead to pulmonary edema. May cause systemic effects. Chronic: Prolonged or repeated skin contact may cause dermatitis. Effects may be delayed. Eye: May cause mild eye irritation. Vapors may cause eye irritation. Skin: May cause irritation with burning pain, itching and redness. Not expected to cause an allergic skin reaction. A single prolonged skin exposure is not likely to result in the material being absorbed in harmful amounts. Ingestion: Aspiration of material into the lungs may cause chemical pneumonitis, which may be fatal. May cause central nervous system depression. Inhalation: May cause respiratory tract irritation. Inhalation of vapors may cause drowsiness and dizziness. Chronic: Prolonged or repeated skin contact may cause defatting and dermatitis. 1. Fuson RC, Walker JT. 1,4-dibenzoylbutane. Organic Syntheses, Coll. 1943; 2: 169. 2. Pavia DL, Lampman GM, Kriz GS, Engel RG. Introduction to Organic Laboratory Techniques. 4th ed. Belmont: Thomson, Brooks/Cole; 2007. 6. Botelho, Scherbakoff, Rezende, Kawamoto, and Jairo. Synthesis of Polyamide 6/6 by Interfacial Polycondensation with the Simultaneous Impregnation of Carbon Fibers. Macromolecules Volume 34, Issue 10, January 2001, Pages 3367-3375.